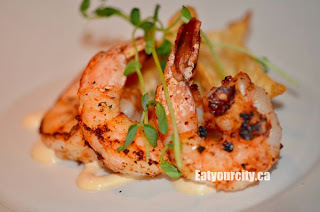 Eat Your City: Red Ox Inn Edmonton, AB revisited.. over and over and over.. yummy! 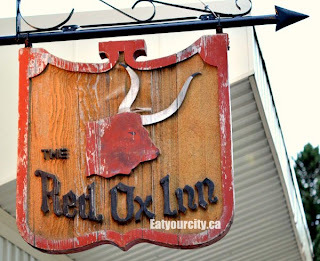 Red Ox Inn Edmonton, AB revisited.. over and over and over.. yummy! I'll admit, I'm a bit biased towards this restaurant as I've seen it grow from a cozy neighbourhood joint where you can drop in anytime for great food made with organic and locally sourced ingredients, to what it is now: a fancier affair for special occasions or an important date night... and you better book a few weeks in advance if you have larger tables. Click here for a previous review. My boyfriend had his new Nikon D7000 with us, so we snapped some pics! (sorry for the blurriness of the pics, still need to figure out how to use it in low light settings). The medium dark wood tables, booths and chairs are still the same - with some rearranged from a reno a while back, the walls are a crisp white, and fanciful, yet smile inducing homey touches make you feel like you're stepping into someones nice dining room. The 3 paintings of the super adorable kids set into the wall when you walk in - are portraits of the chefs Andrea and Frank Olson's kids! 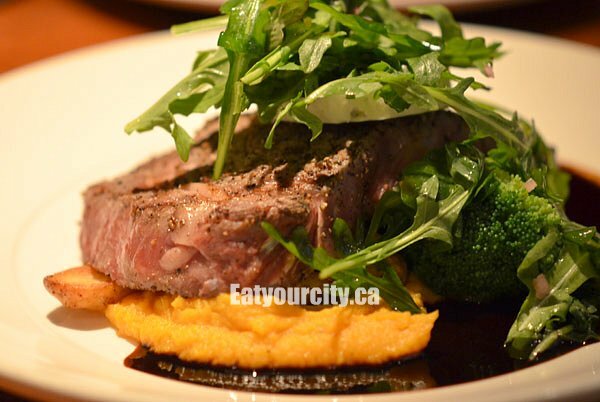 Service is exceptional - friendly, helpful and probably the only place in Alberta where you'll get treated like a family friend - even if you're new to the restaurant. The main entrees and appetizers haven't changed much over the years - but only if you don't count the chefs playing with different sides and spices to keep things fresh, oh and they always concoct something new on their specials list. Because the seating area is cozy and intimate.. this is also true of the rest of the space this little restaurant occupies... space is limited. They offer a moderate wine list of bottles from round the world - California, France, Aussie, and a few from Austria and Spain. They still have affordable bottles around $35-50, and a noticeable addition of more expensive vintages most from California in the $60-130 range, topping out with a bottle of Joseph Phelps' Insignia from Napa Valley for a cool $325 a bottle. I would have liked to see more Canadian vintages, but didn't see any on their list that night. 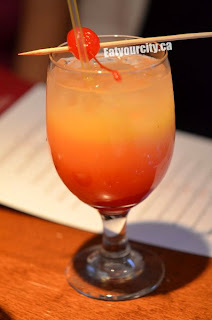 They have also have very small bar at the back, so we went with the Shirley Temple and beers from a decent selection (Stella, AlleyKat amongst the list of microbreweries, Heineken etc) rather than wine since we were having a catch up dinner with friends from out of town. 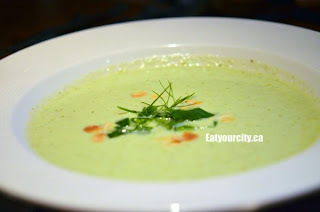 Being a hot muggy Sunday afternoon, and we had just spent hours out in the sun at Hawrelak park, a cool cucumber and almond gazpacho with dill sounded wonderful. Not a trace of tomatoes in this refreshing soup and they weren't missed. Cool, slightly creamy and refreshing with a zing of dill and pickle-y flavor. It reminded me strongly of a homemade pickle soup a Baba made for me years back. Ok, pickle soup is usually served warm, but you get what I mean. The little paper thin slices of roasted almonds tied the soup nicely together, adding in a bit of depth to the soup and a touch of nuttiness. The pickle-iness of the gazpacho piqued our appetite... and only made us hungrier for the next dish lol! To balance out the cool and refreshing gazpacho, we go with their tried and true grilled prawns with corn and shrimp dumplings. Organic and from Aussie, these prawns are large, seasoned lightly and seared to perfection.. They're served with two crunchy crisp deep fried shrimp and corn filled wontons (kinda blurry in the picture and hidden in the back), sit in a mild sweet chipotle mayo and garnished with microgreens. Mmmmm. Strangely, I liked the wontons more than the huge prawns - the corn bits added in sweetness that accentuated shrimp's inherent sweetness. Nom. First off, we had The grilled Duck. The capitalization is because its that good! The duck breast is seasoned and gently grilled to a medium rare - the skin is crispy, super flavorful and my boyfriend claimed "I'm soooo not sharing!" but I still managed to sneak off with a few pieces! Woohoos! In the past its been served thinly sliced against the grain, tonight its served in larger slices.. the duck kept its nice warm temp better than when it was sliced thin. The duck was sitting atop a small crispy roasted tube of proscuitto wrapped fennel (needed a bit more time in oven to completely caramelize), crisp risotto cake (think risotto shaped and dusted with fine breadcrumbs and fried), garnished with some roasted veges, with everything laced in a lightly tangy balsamic cherry sauce. 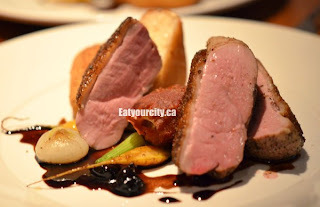 *beatific smile* now that's a mean duck breast... Best Duck in the city! Being in Alberta, where we're fanatically proud of our beef, the Red Ox Inn does it justice with a huge slab of Alberta Rib Eye. Its served with with additively tasty roast fingerling potatoes, a salty garlic and balsamic demiglace, a chunk of creamy blue cheese and a decadently whipped vanilla yam puree that I swear is normally a dessert. Mmm! The 10-12? oz rib eye dwarfs the plate. The slab is placed on top of the sides.. and you can barely see the sides its squishing. Seasoned and grilled to your liking (mine is warm blue rare), its tender and flavorful. I'm not a huge fan of double creamed blue cheese, so I scraped it off and had it a bit of it later along with the balsamic laced salad greens it was garnished with.... after I scooped up every last scrap of the delicious whipped yam. Nom. I want a mixing bowl full of that whipped yam. Sooo good and goes surprisingly well with the salty savoriness of the steak. 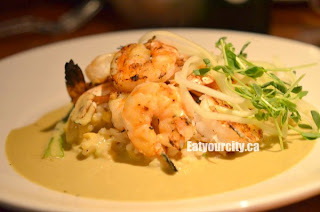 A fellow foodie went with the grilled wild sea tiger shrimp served with a mango studded risotto sitting in a generous puddle of coconut curry and garnished with a raw tangy green papaya salad and microgreens. The shrimps were seared perfectly, and the curry aromatic with coconut and spices. He made the dish disappear so fast, I almost didn't get a chance to ask what he thought of it before I was facing an empty bare and very clean plate lol! Another foodie went with the Artic Char seared fillet served on a bed of creamy smooth and rich scallion mashed potatoes, sauteed savory wild mushrooms and greens, with everything laced in a corn butter sauce. Everything is better with butter in my books. The fish was seared beautifully - the skin was a golden crunchy crisp, with the fish a succulent and moist number. 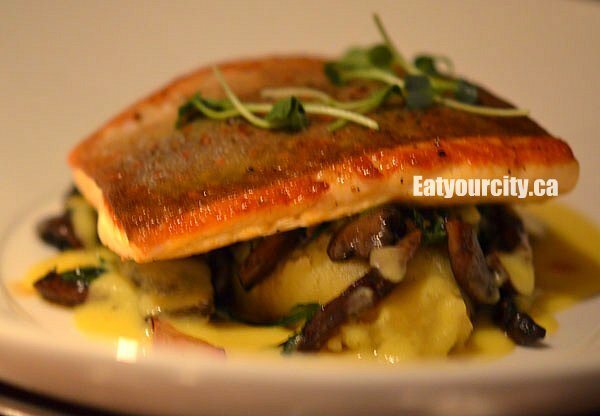 The delicate and unique flavor of Artic Char worked well with its sides, with the sweet and buttery sauce tying everything together. This dish disappeared quickly as well. With all their desserts made in house - Chefs Andrea and Frank are passionate (or insanely so since they work from 9am- to a few hours after closing everyday) about their food, can't pass up an opportunity to try some! The blueberry and white chocolate bread pudding served warm with a large puddle of creme anglaise is good, and their seasonal keylime pie or lemon tart is out of this world - but sadly, only the bread pudding is available tonight out of the 3. Then our eyes lit upon something new... a vanilla panna cotta with fresh summer berries in a ginger syrup. Panna cotta? Berries? Ginger? I'm so sold... and skip their yummy crabcake appetizer to save room for dessert. 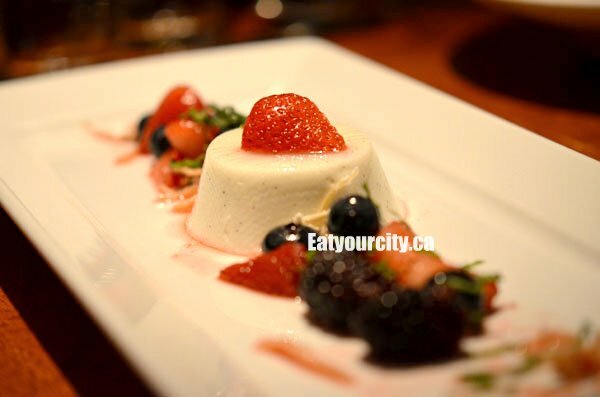 The panna cotta is silky smooth and rich with cream and vanilla specks. The ginger syrup is very light and adds in a light subtle sweetness to the pile of blueberries, blackberries and strawberries on the plate. A few pieces of candied crisp ginger gives this dish an extra zing. One of my fellow foodies isn't a fan of ginger, and Chef Andrea plated her panna cotta ginger free and still super tasty... plus personally brought both out for us :) I hope Chef Andrea and Frank keep this panna cotta on the dessert menu... only wish it was a bit bigger as it disappeared within a few glorious bites. Although its gone a long ways from its humble beginnings, Red Ox Inn is still the place to go for amazing food where the chefs put thought, passion and love into their menu with phenomenal service. This is where you can rub elbows with other patrons in a cozy, yet classy setting and be treated like family friends. Even if their weathered sign probably hasn't been painted since they've opened, Red Ox Inn will continue to evolve and set an example to all restaurants - this is what food and service should be. Not just using locally sourced or organic ingredients - but transforming down to earth ingredients without getting too pretentious about it along the way. The D7000 is supposed to be a really good camera. Now, I don't have any camera envy right now (I use a several years old D40 and, despite it lack features, I think I do a really good job with that camera, if I can say so myself!) but, if something happened and I had to get a new one, in a way it would be a coin flip between the D7000 and the D300s. Actually, I might consider getting the D700 but that also means $1K more moola!!!! There is one "gotcha" if you use it to take pictures of food in a restaurant: It is heavy! The body only is ~700g (compared to the ~475g of the D40) so I won't be partially surprised you had a hard time holding it steadily for a long enough period of time. *blinks blankly at techno babble* :) We've just started to use it.. haven't played with it enough to be an expert at the settings (and how to use them properly) lol! I do like the crispness of the pics (if I can hold still enough for the front to focus nicely), but yes, we're taking the pic by leaning back a fair amount or the focal point is only on one piece of meat or a small part of the plate and the rest of the plate is blurred. Oddly enough, despite it being a macro lens, it takes ok people pics too. The lens doesn't perform great in low light (but we haven't played with exposure and aperature settings).. and though the flash is softer than our old point and shoot, we find it a bit too harsh on closeups, and will spin our food into brighter lit areas of the table to take a shot (unless it makes it really obvious). As for other lenses.. need to save up before we pick up a "regular" non-macro lens.. only have the macro right now, since we take most of our food pics are close ups. And as for weight... seriously, they need to make a well functioning DSLR small enough to fit into a woman's purse.. and I'm not talking about the spacious "I have several kids so my purse can and does hold everything but the kitchen sink" purses, but a modestly sized one... Hate the fact we have to lug around the "lunch bag" sized camera bag for the D700... its a heavy sucker... sometimes we feel like we're gonna turn into giraffes after carrying it around for a while on our necks. And finally back to the food - Red Ox Inn is special to me.. its one of the few restaurants that have stood the test of time, and still remains true to its roots, its values and maintains a fresh and updated menu with exceptionally good service that is difficult to find anywhere else. You don't need a special occasion to try it out... but most of my friends that have tried it, love the staff, the food, the atmosphere so much, they save it for special occasions. According to the manufacturer, the Olympus E-420 is "5.1 in. (W) x 3.6 in. (H) x 2.1 in. D / 129.5 mm (W) x 91 mm (H) x 53 mm (D) (excluding protrusions)". That makes it one of the smallest SLRs that I know of. And this is the killer: They call this lens a "pancake" lens. Why? Because it is ~24mm high. Of course, there is always a catch: Olympus is not the best know brand so… :) Also, if that was the case, do you really need an SLR? In that case, I might as well get a point and shoot! Actually, Nikon call that lens a "Micro" lens and it is more for close-up. However, in the end, it is more dependant on how you use it. But, believe me, if it is for food, the lens I mentioned works a lot better. (The weakness of that lens, though, is that it can't focus to infinity). Having said that, it is not true that your lens is not good for low light. It is not the best (the 35mm is f/1.8; yours is f/2.8); however, it does a way better job compared to the kits lens (which usually goes from f/3.5 to f/5.6). Non technical version: It is better than you think but you need to know how to set it. It won't get better if you keep on using auto mode! @ Kim Huynh, as they say, don't get mad, get even... Just go to the restaurant yourself, hahaha! Hey Kimchee... you totally didn't bring ME when you had the bacon wrapped steak!! So in my books, we're even! LOL! ;D As much as I love bacon, I prefer my steak unadulterated with just some simple seasoning.. so it can speak for itself. I like their steak better when its a prime rib cut rather than the generic "rib" steak (even though the portion size was huge) - the prime rib is more tender and flavorful... hopefully they'll bring it back.